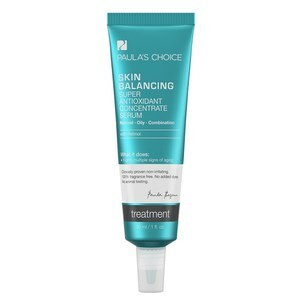 Achieve a smoother, more refined complexion with Paula's Choice Resist Advanced Smoothing Treatment 10% AHA; an ultra-concentrated, peptide-infused formula that expertly improves skin tone and texture. Powered by Lactic, Glycolic and Malic Acids, the lightweight, silky fluid delivers a gentle exfoliating action to buff away dead surface cells and visible sun damage, whilst providing anti-aging benefits to help minimize the appearance of fine lines and wrinkles. Antioxidant-rich Green Tea and Grape Seed Extract are combined with soothing Allantoin and Liquorice to defend against environmental aggressors for long-lasting comfort. Dry, dull skin is left radiant and youthful-looking with restored vitality and reduced pores. Apply once or twice daily after desired cleansing and/or toning. Dispense one pump and smooth over face including the eye area (avoid lash line and eyelids). Do not rinse.